Hey, friends! Remember last month when I shared with you about the first ever meeting of my real-life “Crafty Ladies” group and the fun decorative wooden blocks we made? Well, we recently got together again to have some more girl-time and craft therapy. This time, more ladies were able to join us for our spring projects. My friend “Short Jess” decided to cut a butterfly out of a piece of fabric in my stash and Mod Podge it on top of a coordinating fabric. Then, she added ribbon and left the very top natural. My friend Kelly painted her pot and added “Live Simply, Live Hopeful” around the rim with alphabet stamps. She decided to use her eggs as plant markers when she and her hubby plant vegetables and herbs this year. Another butterfly lover, my friend Sarah, used fabric on her flowerpot and painted her eggs in various spring colors. My mom, Sherl, covered her pot in turquoise polka dot fabric and a contrasting bow. She decorated her eggs with spring-y ribbon and small flowers. My girl Erin, who I’m sure you remember from the Christmas Handprint Plaque and various other crafty adventures, made this fun flowerpot covered in turquoise fabric and eggs stamped with special words. I am loving the pink eggs made by my friend Tall Jess…she trimmed scrapbook paper with pinking shears, wrapped it around the painted eggs, and finished it off with some twine. She also used fun green fabric on her flowerpot and a wired twine accent. I’m crazy about the eggs my friend Jenni made: “He is…Risen, Lord, Friend, Savior.” Love it! Her pot turned out gorgeous too, covered in fabric and finished off with a ribbon accent. And me? Well, I stamped some words on the eggs, then used my Martha Stewart dauber to add colored polka dots. I like the way they look arranged in this basket I found. And my pot? Well…it speaks for itself, doesn’t it? Who saw that one coming? What do you think?! Do I have an amazingly talented and creative group of friends or what? I just love these girls and I love having a time set aside each month for getting together to make fun things! Which projects are your favorites? I did see yours coming lol but everyone’s looks so great. I love all the unique creativity! I agree. You have a great group of crafty friends. I wish I was more crafty. Ooh I really like the flower pots! I am going to pin for later. I am in the process of adding some color to my backyard so I just bought some plain terracotta pots and thought…I can so something with these. Thanks for sharing! You and your friends created some really beautiful things! Those are amazing! My favorite is the butterfly flowerpot! It’s very lovely! Thanks for sharing! What a bunch of crafty gals you have as friends! You all did an amazing job, and I’m sure had a blast in the process. My favorite is between Tall Jess’ twine tied pink eggs and the polka dot eggs. Both really appeal to me. Thanks for sharing! what a fun idea!! 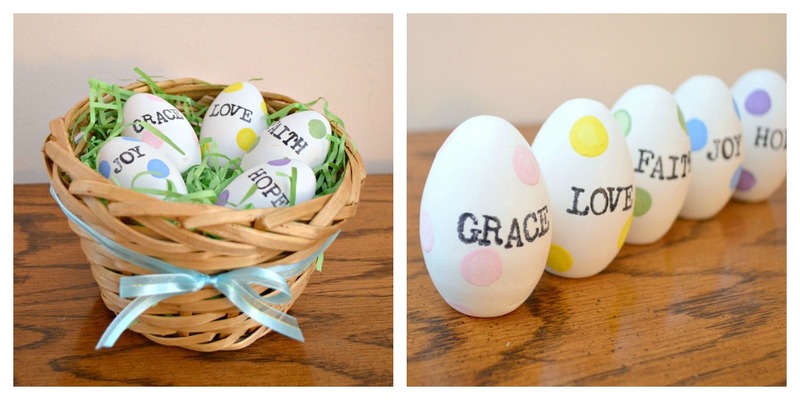 I love new ideas to decorate easter eggs!